If you’re an author or illustrator seeking to find a niche in the school visit market, having a well-planned, standards-aligned Presentation Packet as part of your media kit is a must. Documents such as this one created for debut author Jen White communicate to educators that you honor their need to offer quality academic content while having a great time doing so! You're letting the gatekeepers know that, not only will you bring your enthusiasm for reading, writing, and hanging out with kids to the school visit, you’re providing a wealth of great, value-packed, follow-up fodder, too. Click on image to download Presentation Packet. 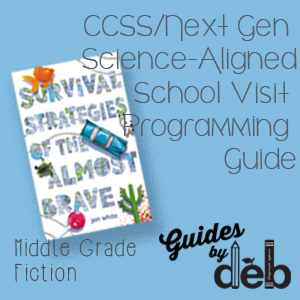 The Presentation Packet created for Jen’s fantastic Survival Strategies of the Almost Brave (Farrar, Straus and Giroux, 2015) is divided into three sections; the inspiration for each is based on this heart-warming, expertly-crafted survival story. The lessons are designed to pull the child into the story experience through consideration of their own survival strategies in strangely unfamiliar habitats. Being that Jen features a number of very cool animal habitat videos during her school visit, specifically created graphic organizers and various writing prompts complimenting her presentation are included in the packet – ready for downloading action! In short, any educator who desires to enrich their students’ classroom experience should consider inviting Jen White to present her program. Not only has she written a memorable story that will remain in the hearts of readers long after they turn the final page, she’s prepared to creatively support the curriculum by demonstrating the use of figurative language, nuances in word meanings, word relationships, a discussion of the notion of natural selection and much more!